As the dream cruise weekend is coming to an end, all of the old school to newer looking cars are being put back into the garage for next year. The Dream Cruise weekend is an opportunity to show off your best looking car no matter the shape, the size, or the model. 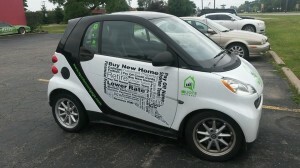 If you had the chance to have the best looking vehicle graphics on Woodward, would you capture it? Or just let it slip? 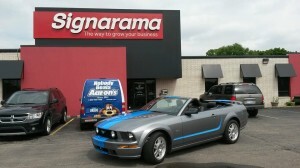 Signarama Troy has the best looking vehicle graphics in town! We can deal with any type of car, any color, and any size you can think of! If it moves, we can put graphics on it. We cover everything including: full vehicle wraps, vehicle graphics like a logo or quote, vehicle lettering, and even vehicle magnetic toppers.Everything we make is completely custom, so even if you have the craziest imagination, we could make something that fits it! It is never too soon to get a jump start on next year! The worst thing you can do is wait until the last minute to get custom vehicle graphics put on your car. 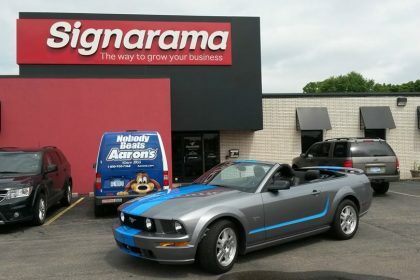 Bring your vehicle into Signarama Troy today and get the best looking vehicle graphics around!